It is becoming common knowledge that some form of wine is produced in every state and within scenic West Virginia about 15 wineries call home. The eastern section of the state, the Potomac Highlands, contains the South Branch Valley which is a small micro climate. Called a Rain Shadow, the area receives little precipitation and low humidity because they are located on the leeward side of the Allegheny Front. (See picture below for more information.) For almost thirty years, West-Whitehill Winery has been cultivating French Hybrid grapes in the valley and selling the wines to a steadily growing domestic market. Because of this domestic market, the wines are made on the sweeter side. The only completely dry offerings are a nice medium bodied Chambourcin aged in French oak and a Seyval Blanc. They also produce the West Virginia red which is basically the Chambourcin made off-dry. Our favorites were the two semi-dry wines, the Vidal Blanc and a second Seyval Blanc - both made with about 1.5% r.s. Both portray nice fruit characteristics, but we were won over by the acidic content. Both are refreshing wines. The most interesting wine is their Aurora Blush. I wonder how many readers have even heard of this grape, or of the Chancellor that is added to enhance the color. Its actually a decent wine, not necessarily fitting into our tastes, but during a visit a couple entered the tasting room and purchased a case. That's how the winery stays in business. With assistance from the sweet wines. There's the Highland Mist, a blend of hybrid grapes and orange and lemon spices; the Mountain Spice, this time with cloves and cinnamon added to the juice; the Classic Currant and the Raspberry Royale. These last two are definitely worth tasting; for us - substitutes for dessert wines - for others - table wines. The Currant wine is made from California juice and white grapes. The flavor basically explodes off the tongue - how many currants are picked to make a bottle? The Raspberry Royale is a blend of the Aurore and red raspberries and the flavor also stays in the mouth from the initial taste to the tail. 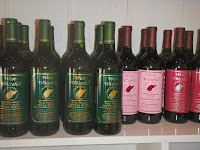 West-Whitehill Winery is a small winery, making only about 2,000 cases a year. Their tasting room is only open during the weekend, so most of their wines are sold in retail outlets - particularly tourist shops. In Thomas, we noticed several customers carrying 3 bottle boxes purchased from the Riverfront Antiques & Thrift. Why not a bottle of wine as a souvenir or a gift. 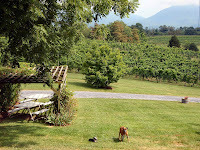 Nestled among farms and cattle ranches are the dozen or so wineries comprising the Shenandoah Valley Wine Growers Association.The oldest of these, which makes it the third oldest in the state, is Shenandoah Vineyards, located just off Interstate 81 in Edinburg Virginia. Known as the "breadbasket of the confederacy", the valley's fertile soil is home to thousands of small farms. One of these started in 1976, when Jim and Emma Randel planted 5000 vines of several French Hybrid varieties that they believed were well suited for the valley. In particular they were the first to champion Chambourcin as a suitable alternative to vinifera reds, at a time when the technological knowledge on how to successful grow vinifera grapes was lacking. These original vines are still producing fruit right behind the winery. In total, Shenandoah Vineyards now has 26 acres of vines planted of eleven varieties of grapes. The first surprise we noticed when viewing the tasting sheet was the number of dry wines in the portfolio. 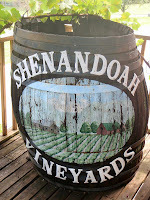 Many wineries in similar locations must produce primarily sweet wines in order to fill the needs of the local market, but Shenandoah Vineyards had a nice 50/50 split. For instance they produce two versions of dry Chardonnay; the Founder's Reserve, a dry and buttery wine a result of aging two years in French Oak and a stainless steel fermented vintage Chardonnay. Of the two, we preferred the later, mostly because that's the style we like - let the flavor of the grape speak for itself. The also produce a dry Sauvignon Blanc that is fermented and aged in American oak - it was nice - but we still preferred the vintage Chardonnay. Getting sweeter they offer a semi-dry Johannisberg Riesling and their proprietary Shenandoah Blanc - the winery's best seller. In fact, we added to this trend, thinking this wine would be adopted by the National Guard members we were visiting that night. Its a nice everyday wine - fruity but not overly sweet. Plus, priced under $11 - why not. Turning to reds, we started with the Founder's Reserve Pinot Noir, which is a light dry wine - but with a nice flavor. We decided that we would be different in chill this wine and serve as an alternative to a dry rose. Up next was the Founder's Reserve Chambourcin, the grape the couple first championed, and they have produced an impressive red wine. It is full bodied - but smooth; a very nice wine. We liked this more than their vintage Cabernet Sauvignon which just didn't have the same full bodied fruit flavor as the Chambourcin. 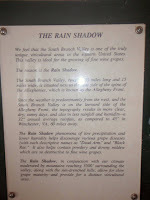 The winery also produces a couple off dry to semi dry red wines, the Shenandoah Ruby and Rebel Red. The later is actually served chilled - although don't confuse this with a rose style wine. Both of these wines are designed for people who are a little skittish about drinking red wine. 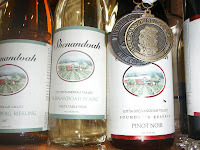 Shenandoah Vineyards does offer a few sweet wines such as the Sweet Serenade, Fiesta, and Raspberry Serenade. Because of time limitations we didn't sample these wines, but were told they were quite popular. Now in her 80's, Emma Randel still operates the winery. She is a valuable source of knowledge for the Virginia wine industry since most wineries lack historical knowledge of how grapes react over time. She has witnessed cyclical variations in weather; pests; disease; and many other issues that most infant wineries in the state have not experienced. She is a valuable source that the industry needs. 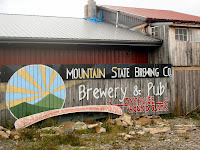 To see for yourself - take a break from driving and pull off Interstate 81 - and enjoy nice wines with clear views of the Blue Ridge Mountains. On Saturday July 11th, we attended the first annual DC's Wine Country - Food and Wine Festival, not as an attendee, but as a volunteer. Good thing, because that evening was completely sold out - 1,500 people had purchased tickets. They had prepared to travel to beautiful Bluemont Virginia and enjoy about a hundred different wines from Loudoun County wineries. Along with fellow blogger Dezel from My Vine Spot and fellow wine drinker Brian, we poured wines for our friends at Corcoran Vineyards, perhaps the most popular winery at the event. Maybe it was a result of sponsoring the pre-festival dinner or merely of crafting excellent wines; but we were besieged the entire night. OK, a slight exaggeration; but we were busy. Almost all the Loudoun County wineries participated in the event from the oldest, Willowcroft Farm Vineyards, the biggest, Breaux Vineyards, Chrysalis Vineyards, Tarara Winery, the smallest, Zephaniah Farm Vineyard, to some of the newest, Dry Mill Vineyards & Winery and Quattro Goomba's Winery. One noticeable exception was Notaviva Vineyards, who welcomed a new addition to the family earlier in the week. Congratulations. Before our pouring responsibilities contained us, I was able to visit a few booths - couldn't taste - but I could see what was in store for the attendees. The Village Winery & Vineyards had their Apple, Elderberry, and a Petit Verdot, which I was very interested in trying - it seems most of these wineries had warmed to this grape. The aforementioned Zephaniah Farm Vineyard had bottled a Cabernet Sauvignon as a companion to their Cabernet Franc. Breaux Vineyards had produced a Nebbiolo Ice Wine, but since their booth was unoccupied at the moment - I couldn't confirm whether it was a true ice wine. And finally I learned that Hiddencroft Vineyards has some nice wines aging in their cellar - they should be expecting a visit later this summer. Besides wine, author Ellen Crosby was available to autograph books. I was briefly able to discuss how Mrs. Swedenburg, the former patriarch of Swedenburg Estate Vineyard assisted her on her research. And in fact the winery was the inspiration for The Merlot Murders . Her latest in the series is The Riesling Retribution: A Wine Country Mystery; perfect summer reading. Before exploring more, duty called and it was time to start pouring some Corcoran wines. Lori Corcoran had brought her stellar Viognier, the easy drinking Cabernet Franc, spicy Malbec, and full bodied Meritage - a blend of the first two reds plus a shot of Merlot. It was a real pleasure serving these wines, because we knew they were going to be popular - not a bad wine in the bunch. This statement was verified several times by other attendees who were quick to state that this was the only winery were they liked the entire selection. And this was a wine educated crowd. A clear majority not only were familiar with grapes, but knew which were best suited for the Virginia climate. The most common misconception was that a few attendees were not aware that Malbec was a Bourdeaux grape and thought it was indigenous to South America. Many were even aware of Tannat, which Lori adds to the Malbec - maybe for some earthiness? Either way, Tannat and Malbec should be considered along with Petit Verdot as old world grapes suitable to Virginia. And in fact, all of Corcoran's grapes are grown in Northern Virginia, either at their estate or in vineyards surrounding Purcellville & Winchester. A little micro-climate. Before long, the three hours were finished. We were thirsty - no drinking in the booth. And there was no time to sample from the other wineries. Oh well; the only other disappointment was not being close to the music stage. Throughout the night I heard a few notes from Moon Music and Hard Swimmin' Fish (pictured on the left) - enough to peak my interest - but not able to hear the entire set. Fortunately they play regularly at local venues - perhaps On the Border on Thursday night. From what we witnessed Saturday, this was a successful festival - well run and popularly attended. We look forward to pouring at next year's festival and actually plan to attend one of the other nights to taste what Loudoun County wineries have to offer. We recently received a letter notifying us that our our newborn Marker's Mark barrel has finally arrived. That is, the distillery has filled a charred American white oak barrel with their signature whiskey plated with the WineCompass name and is gently resting in a warehouse. This is a benefit for joining the Marker's Mark Ambassador program. By joining this program participants receive their name on a Maker’s Mark barrel; an opportunity to purchase a bottle of Maker’s Mark from your batch; updates on the aging of your bourbon; advanced notice of rare, special-release bottles; and invitations to special Ambassadors-only Maker’s Mark tasting events. Sadly, we couldn't attend the last one scheduled in Washington D.C. 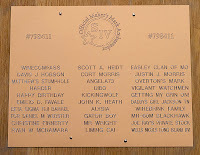 In return, participants do all they can to promote the Maker's Mark brand. Hence, this post. So what makes Maker's Mark any different then the dozens of premium bourbons on the market. It starts with the ingredients. In order to be labeled bourbon, the whiskey must derive from at least 51% corn; the rest is usually barley and rye. Maker's Mark uses yellow corn from specially selected small farm cooperatives to ensure only the highest quality corn. Instead of rye, the distillery uses red winter wheat which produces a gentler taste. This mash is then fermented by a special yeast strain that has been in the Samuels family for six generations. After fermentation, the whiskey is placed in a new charred American white oak barrel and sent to a warehouse where it sits still for a number of years. At bottling a distillery then collects samples from various portions of the warehouse to add to each bottle. This is because the bourbon ages differently depending on its location. Instead of following this process, Maker's Mark rotates the barrels. Possibly the only distillery to do so. According to the distillery, "all our barrels start at the top of the warehouse where they are exposed to the greatest temperature extremes. Hot Kentucky summers cause the whisky to expand into the wood. Cold winters cause the whisky to contract back out of the wood. This is what allows the whisky to absorb the wonderful flavors from the wood. When ready, (around three years) each barrel is moved to a lower part of the warehouse to continue its maturation process in a less extreme fashion." That's why we like this bourbon. Add in the trademark red wax and you have your bottle of Maker's Mark bourbon. When will be able to see our "baby" barrel? Well, online or a taking a trip to their Loretto, Kentucky facility. When will we be able to taste the aging bourbon? In 6 or 7 years. I hope we don't forget about the barrel during this process. We wanted to remind our readers that the first annual DC's Wine Country - Food and Wine Festival starts in less than a week. This festival is held during the evenings of July 10-12, 2009 at the historic Whitehall Manor in Bluemont, Virginia and will highlight the fabulous wines being produced by twenty wineries in Loudoun County. Besides the $30 general admission, there are a few dining packages available. All proceeds will benefit the Virginia Food & Wine Foundation general scholarship fund which supports culinary arts and wine studies. Arizona Vineyards, was destroyed by arson on June 5th. Here is the complete story from Wines & Vines. 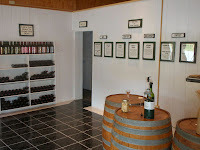 The winery had been owned and operated since 1984 by Tino Ocheltree. Apparently a nomadic neighbor entered the property while Ocheltree was setting up for a party and poured gasoline on the structure and set it ablaze. Ocheltree and his companions were able to capture the criminal. He had just finished bottling his 2008 vintage, 3,000 cases, which were lost in the blaze as well as all his winery equipment and wine making memorabilia. Ironically Arizona Vineyards does not grow grapes, so Ocheltree can not fall back on sourcing grapes while he rebuilds the winery. He has created a tax-free foundation to accept donations. To learn more, call him at (520) 313-0226 or e-mail delfinjuly@yahoo.com.